While Summer is for getting outside and building, the clocks going back mean the unwelcome end of daylight evenings, but also a chance to catch up on blogging. I’m not only behind a progress update on the permanent way – but also on rolling stock. 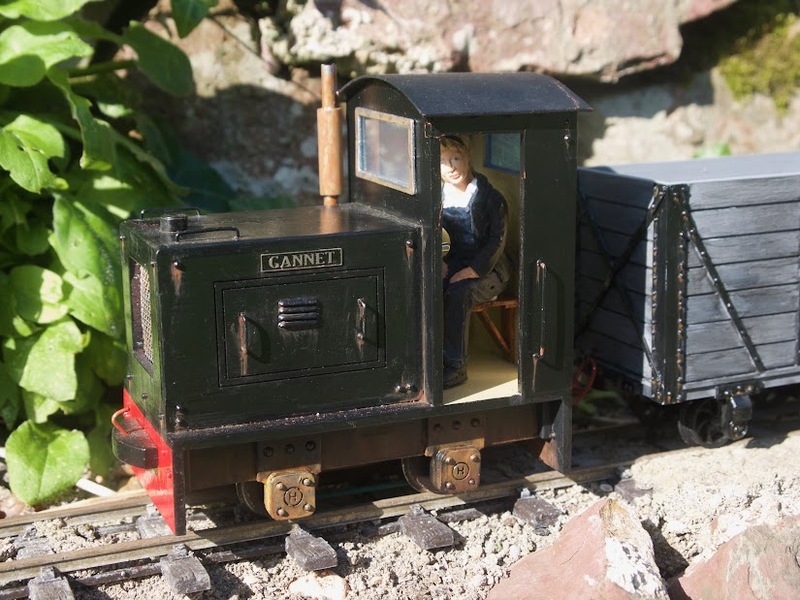 So here’s a look at Moel Rhos’ loco No 1, which now has a name and a driver and some details. I’ve already described the build so I’ll skip the detail. But I will mention the incredible after-sales from David Hippey at HGLW. I thought the back-to-backs were too narrow and asked him how to widen them. He not only explained how to do this, but offered to do it for me, or send replacement wheels! He also suggested I check the track – which of course turned out to be the culprit, not the loco at all! On top of all that, he took the time to look at this site, watch a video of the loco running, and then purely by the sound alone diagnosed an adjustment of the motor position would extend the life of the gears! I’ve mentioned what a bargain this kit was at under £30, but of course it comes with little detail. I’ve added some with an equally frugal eye on the railway’s budget: radiator cap from an old biro, handrails and exhaust from recycled electrical wire, a few rivets (cheap gems for finger nails), a driver’s seat from coffee stirrers. The most expensive item was the name plates; even these were only £7.50 from Narrow Planet (albeit with a 3 month wait). On such a cheap loco this increased the value by 25%! The driver from Mike’s Marvellous Models was the next priciest at £5 (she was painted by my sister). The louvres are from Cambrian NA17, not a whole pack, just about 40p worth at a guess. No. 1 is named Gannet, after one of my favourite birds that can be seen locally. Besides a cosmetic make over, I’ve had to replace the motor owing to neglect on my part: while my attention was elsewhere the gears chewed up a leaf and jammed. By the time the rescue party discovered the stricken loco, the motor and batteries got quite hot! I thought I’d got away with it, but eventually the motor did fail and it was clear the brushes had been burned almost completely away. I found a replacement motor for a couple of quid on ebay which was quite easy to fit and thankfully the loco still runs well.